Gran Canaria was defeated by San Pablo Burgos at home 74-81 on 30.12.2018 ACB Liga J14. CSKA Moscow (Russia) defeated Kalev Cramo (Latvia) on the road 85-80 on 30.12.2018. Real Madrid defeated Baskonia on the road 91-74 in ACB Liga Endesa, J14 on 30.12.2018. ACB Jornada 14: Baskonia 74 - 91 Real Madrid on 30.12.2018. Kirolbet Baskonia defeated by Real Madrid at home 74 - 91 on 30.12.2018 ACB Liga Endesa J14. Facundo Campazzo leads Madrid to the big win over Baskonia, scoring double-double 15 points and 10 assists on 30.12.2018 ACB Liga Endesa J14. Kevin Seraphin leads Barcelona to a win with double-double 18 points, 11 rebounds and 2 assists against Obradoiro Cab on 29.12.2018 ACB Liga, J14. FC Barcelona Basket 79 - 73 Monbus Obradoiro on 29.12.2018 Liga Endesa ACB, J14. Panathinaikos Athens defeated CSKA Moscow at home 96 - 84 on 28.12.2018 in Euroleague day 15. Panathinaikos Athens 96 - 84 CSKA Moscow 28.12.2018 Euroleague regular season Round 15. Jan Vesely scores 13 points, 5 rebounds and 2 assists in the HUGE win over Real Madrid in Euroleague round 15 on 28.12.2018. Fenerbahce Istanbul 65 - 63 Real Madrid on 28.12.2018 Euroleague regular season round 15. Anthony Randolph scored 11 points, 1 assist and 5 rebounds against Fenerbahce on 28.12.2018 Eurleague regular season round 15. FC Barcelona Lassa defeated Anadolu Efes at home 80 - 65 in Euroleague round 15 on 27.12.2018. Johannes Voigtmann scored 14 points, 4 assists and 2 rebounds against BC Khimki on 27.12.2018 Euroleague round 15. Baskonia defeated BC Khimki Moscow on the road 85-77 on 27.12.2018 Euroleague rs round 15. Khimki Moscow was defeated by Baskonia at home 77 - 85 on 27.12.2018 in Euroleague round 15. Khimki Moscow 77 - 85 Kirolbet Baskonia on 27.12.2018, Euroleague round 15. CSKA Russia defeated VEF Latvia on the road 107-80 in VTB League on 23.12.2018. CSKA Moscow crushed VEF Riga on the road 107 - 80 on 23.12.2018 in VTB United League. Unicaja Malaga was defeated at home by Baskonia 81-64 in Liga ACB jornada 13 on 23.12.2018. Luca Vildoza helps Baskonia to beat Unicaja with 14 points, 3 assists and 4 steals on 23.12.2018 ACb Liga jornada 13. Johannes Voigtmann scores 11 points, 7 assists and 8 rebounds for Baskonia in the win over Unicaja 23.12.2018 ACB Liga jornada 13. 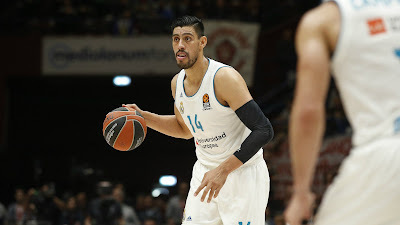 Real Madrid defeated UCAM Murcia at home 80-74 in ACB Liga Endesa on 23.12.2018 Jornada 13. Trey Thompkins leads Real Madrid to the tough win over UCAM Murcia, scoring 22 points, 1 block, 1 assist and 5 rebounds on 23.12.2018 ACB jornada 13. Gipuzkoa Basket 71 - 104 FC Barcelona Lassa on 22.12.2018 ACB Liga Endesa J13. Gipuzkoa Basket 71 - 104 FC Barcelona Lassa on 22.12.2018 ACB Liga Endesa Jornada 13. CSKA Moscow crushed Anadolu Efes at home 102 - 84 in Euroleague regular season round 14. CSKA Moscow defeated Anadolu Efes at home 102 - 84 on 20.12.2018 Euroleague RS Round 14. Iberostar Tenerife defeated Baskonia at home 70-63 in the ACB Liga Endesa. Tornike Shengelia got a double-double 18 points, 10 rebounds and 1 assists against Tenerife 15.12.2018 Liga Endesa jornada 12. 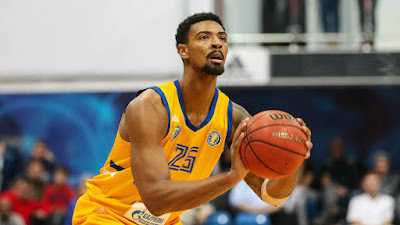 Marcus Eriksson leads GranCanaria to a win with 15 points and 2 rebounds against Buducnost Voli. Barcelona was defeated on the road by Real Madrid 92-65, Euroleague regular season R12. Real Madrid defeated Barcelona Lassa at home in the classico 92 - 65, Euroleague round 12. Trey Thompkins leads Real Madrid to the BIG win over Barcelona with 17 points, 7 rebounds and 1 block 13.12.2018 Euroleague round 12. Jaycee Carroll scored 15 points and 1 assist against Barcelona on 13.12.2018 Euroleague round 12. CSKA Moscow beat BC Khimki in Russian derby 88 - 74, Euroleague round 12. CSKA Moscow defeated Khimki Moscow region at home 88-74 in Euroleague round 12. Alex Tyus scored 12 points, 7 rebounds and 2 blocks against Baskonia in Euroleague round 12 on 13.12.2018. Maccabi Tel Aviv lose to Baskonia at home 79-81 in dramatic final seconds of the match. Maccabi Tel Aviv was defeated at home by Baskonia 79-81, Euroleague round 12. Baskonia defeated on the road Maccabi 81-79 in Euroleague round 12. Tornike Shengelia leads Baskonia to win over Maccabi with 20 points and 5 assists on 13.12.2018 Euroleague round 12. Watch Vincent Poirier double-double highlights 12 points and 12 boards against Maccabi Tel Aviv 13.12.2018 Euroleague round 12. Maccabi Fox Tel Aviv 79 - 81 Kirolbet Baskonia 13.12.2018 Euroleague RS Round 12. Check out Brandon Davies Highlights with 14 points, 1 assist and 8 rebounds against Vilniaus Rytas on 09.12.2018. Watch Arturas Gudaitis Highlights with 19 points and 8 boards against vs Cantu on 09.12.2018 Legabasket Serie A.
Acqua S.Bernardo Cantu 74 - 101 AX Armani Exchange Milano 09.12.2018 Legabasket serie A.
CSKA Moscow 101 - 71 Enisey Krasnoyarsk 10.12.2018. Joel Bolomboy Highlights 22 points, 2 assists and 8 boards against Enisey on 1.0.12.2018. Thomas Heurtel scored 11 points and 1 assist against Tenerife on 09.12.2018 ACB jornada 11. Chris Singleton leads Barcelona to the win over Iberostar Tenerife, scoring double-double 12 points, 12 rebounds and 3 assistson 09.12.2018 ACB jornada 11. Watch Tornike Shengelia Highlights with 17 points, 5 assists and 5 rebounds against Breogan 09.12.2018 Liga Endesa ACB J11. ACB Liga Endesa J11: Divina Seguros Joventut 93 - 86 Unicaja Malaga on 08.12.2018. Check out Nicolas Laprovittola highlights with 28 points and 9 assists in the win over Unicaja Malaga on 08.12.2018 ACB jornada 11. Hapoel Jerusalem defeated Hapoel Tel-Aviv at home 87 - 75 in Israel Winner leagye. Zenit Saint Petersburg 74 - 77 Unics Kazan 08.12.2018 VTB United League. Jamar Smith Highlights 18 points and 2 assists against Zenit on 08.12.2018. Zenit Saint Petersburg 74 - 77 Unics Kazan on 08.12.2018 VTB United League. Will Thomas leads Valencia Basket to a win over Andorra with 18 points and 3 assists 08.12.2018 ACB Liga Endesa J11. Gustavo Ayon to lead Real Madrid to a comeback victory over Anadolu Efes on the road 84-82. Ayon named Euroleague round 11 MVP with double-double 20 points, 11 rebounds, 3 assists and 2 blocks on 07.12.2018. Adrien Moerman posts a double-double 19 points and 10 rebounds against Real Madrid. Anadolu Efes was defeated at home by Real Madrid 82-84 in Euroleague round 11. AX Olimpia Milan 86 - 94 Gran Canaria on 06.12.2018 in Euroleague regular season Round 11. Thomas Heurtel scored 9 points and 4 assists against Buducnost in round 11 on 06.12.2018. Tornike Shengelia leads Baskonia to a huge win over CSK Moscow 76 - 73, scoring 15 points, 8 rebounds and 3 assists on 07.12.2018 Euroleague round 11. Kirolbet Baskonia 76 - 73 CSKA Moscow, Euroleague regular season, round 11. Kirolbet Baskonia beat CSKA Moscow at home 76 - 73 on 07 December 2018. EuroLeague Regular Season Round 11: Kirolbet Baskonia 76 - 73 CSKA Moscow 7 December 2018. Euroleague 2018-2019: Kirolbet Baskonia 76 - 73 CSKA Moscow on 07.12.2018 Round 11. Panathinaikos was defeated at home by Fenerbahce 81 - 69 in Euroleague regular season round 11. Nikola Kalinic scored 18 points and 4 assists and led Fenerbahce to a victory over Panathinaikos on 07.12.2018 Euroleague round 11. Fenerbahce Istanbul defeated Panathinaikos on the road 81-69 in Euroleague round 11. Adam Hanga scored 12 points, 6 rebounds and 1 assist against Buducnost Voli on 06.12.2018. AX Olimpia Milan was defeated at home by Herbalife Gran Canaria 86 - 94 in Euroleague Round 11. Alba Berlin defeated Brose Bamberg at home 92 - 88 in Germany BBL. Fenerbahce Istanbul defeated Pinar Karsiyaka at home 80 - 72 in BSL Turkey. Darussafaka was defeated at home by Galatasaray 84-79 in the Turkish BSL . Jeremy Evans had a double-double with 13 points, 11 rebounds, 1 assist and 1 block against Galatasaray 04.12.2018 BSL Turley. Galatasaray defeated Darussafaka on the road 84 - 79 in the Turkey Super League. Baskonia was defeated on the road by Anadolu Efes 96-85 on 30.11.2018 Euroleague. Baskonia was defeated by Anadolu Efes on the road 96-85, Euroleague 30.11.2018. Anadolu Efes beat Baskonia at home 96 - 85 in Euroleague round 10. Darussafaka 71 - 75 Gran Canaria , Euroleague round 10. Bobby Dixon scored 16 points and 2 assists against Barcelona 30.11.2018 Euroleague round 10. Barcelona was defeated at home by Fenerbahce 65 - 84, Euroleague round 10. Nando De Colo Highlights 15 points and 5 assists against Real Madrid on 29.11.2018. Real Madrid 88 - 93 CSKA Moscow, Euroleague regular season round 10. Anzejs Pasecniks scored 17 points and 8 rebounds against Darussafaka 29.11.2018. Darussafaka Istanbul 71 - 75 Herbalife Gran Canaria, Euroleague round 10. BC Khimki defeated Panathinaikos B.C. at home 76 - 68 in Euroleague round 10. James Gist scored 19 points, 9 rebounds, 1 assist and 1 block against Khimki Moscow 30.11.2018. Keith Langford Highlights 17 Pts, 5 Ast vs Khimki Euroleague Round 1. Khimki Moscow 76 - 68 Panathinaikos Athens, Euroleague round 10. FC Barcelona Lassa 86 - 69 Real Madrid 25.11.2018 ACB Liga Endesa Jornada 10. Walter Tavares scored 8 points, 2 blocks, 1 assist & 7 rebounds vs Barcelona 25.11.2018. FC Barcelona Basket 86-69 Real Madrid, ACB Liga Endesa Jornada 10. FC Barcelona 86 - 69 Real Madrid, ACB Liga Endesa Jornada 10. FC Barcelona defeated Real Madrid at home 86 -69 in ACB Liga Endesa Jornada 10. Brandon Jennings Highlights 2018 ᴴᴰ - STAR Performance! Check out very best Highlights from Brandon Jennings of the Zenit Saint Petersburg 2018. James Feldeine drops 28 Pts against Be'er Sheva 24.11.2018 Israel Super League. Obradoiro 74 - 81 Baskonia, ACB Liga Jorbada 10. Monbus Obradoiro 74 - 81 Kirolbet Baskonia, Liga ACB Jornada 10. FC Barcelona 90 - 80 AX Olimpia Milan Eroleague round 9. Jeff Brooks scored 17 points, 5 rebounds and 1 assist against FC Barcelona Basket on 23.11.2018. Lokomotiv-Kuban Krasnodar defeated Enisey Krasnoyarsk on the road, 93-86 (26-19, 17-26, 20-23, 30-18). Jamel McLean played a big part in the Lokomotiv win, he put up impressive numbers: 20 points, 12 rebounds and 2 assists. Lokomotiv Krasnodar defeated Enisey on the road 93-86 in VTB league. Olimpia Milan was defeated by FC Barcelona on the road 90 - 80 in the Euroleague round 9. Watch Kyle Kuric Highlights with 15 points and 2 assists against AX Olimpia Milan on 23.11.2018. FC Barcelona defeated AX Olimpia Milan at home 90 - 80 in Euroleague round 9. Zalgiris Kaunas 83 - 84 Khimki Moscow, Euroleague round 9. BC Khimki Moscow defeated Zalgiris Kaunas on the road 84-83 in Euroleague. Alexey Shved named Euroleague MVP round 9. Euroleague RS round 9: Baskonia defeated Panathinaikos at home 86-77. Buducnost defeated CSKA at home 93 - 92, Euroleague round 9. Clark led Buducnost Voli to the HUGE win over CSKA Moscow at home 93-92. Baskonia defeated Panathinaikos at home 86-77. Keith Langford scored 33 points and 3 rebounds against Baskonia 23.11.2018 Euroleague round 9. CSKA Moscow defeated Zalgiris Kaunas at home in overtime 99 - 77. FC Bayern basketball 62 - 72 Olympiacos Piraeus, Euroleague round 8. FC Bayern Munich 62 - 72 Olympiacos Piraeus 20.11.2018 Euroleague Round 8. Real Madrid beat Gran Canaria at home 89 - 76 in Euroleague round 8. Anthony Randolph leads Madrid to victory with double-double 20 points, 10 rebounds, 2 assists and 1 block. Real Madrid defeated Gran Canaria at home 89 - 76, Euroleague round 8. Alex Tyus Highlights 12 points and 1 block against Anadolu Efes on 20.11.2018. Larkin helped Anadolu Efes to win Maccabi Tel Aviv 90 - 77 on 20.11.2018. Anadolu Efes defeated Maccabi Tel Aviv at home 90 - 77 in Euroleague round 8. Anadolu Efes defeated Maccabi Tel Aviv at home 90 -77, Euroleague basketbal. Tibor Pleiss Highlights 14 Pts vs Maccabi Tel Aviv 20.11.2018. CSKA Russia defeated Tsmoki-Minsk Belarus at home, 119-88 (33-24, 21-23, 39-15, 26-26). Khimki Moscow Region defeated Avtodor Saratov at home, 85-77 (26-20, 26-17, 14-18, 19-22). Khimki needed someone to step up in Shved’s absence and Gill delivered, dropping an efficient 24 in only 17 minutes to go with four rebounds and three blocks. Tornike Shengelia leads Baskonia in the win over Gran Canaria, scoring 16 points, 5 assists and 5 rebounds on 18.11.2018 ACB Liga Endesa J9. Darrun Hilliard helped Baskonia to win with 15 points, 1 block & 1 assist against Gran Canaria 18.11.2018. ACB Liga Kirolbet Baskonia 91 - 76 Gran Canaria, jornada 9. Baskonia defeated Gran Canaria 91 - 76 ACB Liga endea J9. Movistar Estudiantes 84 - 101 FC Barcelona Lassa ACb Liga Endesa jornada 9. Adam Hanga Highlights 13 Pts vs Estudiantes 84 - 101 FC Barcelona 18.11.2018 ACB Liga. Dorell Wright scored 16 points and 1 block against Parma on 18.11.2018. Jamel McLean double-double highlights 16 Pts & 11 Rebs vs Parma in VTB League. Jeffery Taylor led Real Madrid to the victory over Gipuzkoa Basket, scoring 14 points and 2 rebounds on 18.11.2018 ACB Liga Endesa jornada 9. Klemen Prepelic scored 14 points and 1 assist in the win 104-71 over Gipuzkoa Basket 18.11.2018 ACB Liga Endesa Jornada 9. Unics Kazan crushed Nizhny Novgorod at home 89 -64. Darussafaka 92 - 98 AX Olimpia Milano Euroleague round 7. AX Olimpia Milan beat Darussafaka on the road 98 - 92. Thomas Heurtel scored 11 points and 3 assists against Zalgiris. Fabien Causeur led Real Madrid to win over Khimki with 13 points and 4 assists in Euroleague RS7. Kostas Sloukas Highlights 20 points and 4 assists against Olympiacos. Rodriguez helped CSKA to beat Bayern, scoring 12 points and 8 assists in Euroleague round 7. CSKA took a very important victory over Bayern on the road 79-93. Higgins was on fire against Bayern with 18 points and 5 assists. CSKA defeated Bayern on the road 93-79. Derrick Williams near to double-double 14 points. 9 rebounds, 1 block and 1 assist. Buducnost Voli crushed Baskonia at home 99 - 84 in Euroleague round 7. Earl Clark helped Buducnost to win scoring 20 points and 2 assists. Buducnost beat Baskonia at home 99-84. Edwin Jackson leads all scorers with 24 points and 4 assists to help Buducnost to win Baskonia. Bayer Munich 79 - 93 CSKA Moscow Eroleague round 7. Vladimir Lucic scored 12 points and 1 assist against CSKA on 16.11.2018. Mike James leads Olimpia Milano to the victory over Reggio Emilia 100-75, scoring 21 points, 3 assisst and 3 rebounds on 11.11.2018. Ricky Ledo Highlights 21 Pts vs Olimpia Milan, Legabasket. AX Olimpia Milan defeated Reggio Emilia at home 100-75, Ledo had a good game with 21 points, 1 assist and 5 rebounds. Maccabi crushed UNET Holon at home 99 - 66. Rodriguez helped CSKA to win Lokomotiv on the road 93-76 in VTB League. DIvina Joventut defeated Obradoiro 83-79 in ACB Liga Endesa jornada 8. Nando De Colo Highlights 30 Pts, 5 Ast vs Lokomotiv 11.11.2018. CSKA Moscow defeated Lokomotiv-Kuban Krasnodar on the road, 93-76 (32-18, 18-21, 22-22, 21-15). Nando De Colo – the French guard ripped Krasnodar for 30 points and a 39 efficiency rating, despite not scoring in the 4th quarter. He played a big part in CSKA’s strong start and made sure the visitors maintained control throughout the contest. BC Khimki defeated VEF Riga at home 75 - 51 in VTB League. Real Madrid defeated Fuenlabrada on the road 95-80 in ACB jornada 8. Sergio llull leads all scorers with 17 points, 2 assists and 2 rebounds for Madrid. Andorra beat Baskonia at home in Liga Endesa 93-73. Dylan Ennis helped with 14 points, 5 assists and 7 rebounds in the Andorra win in ACB Jornada 8. Andorra defeated Baskonia 93 - 73 in Liga Endesa ACB jornada 8. Shavon Shields scored 16 points and 3 rebounds against MoraBanc Andorra on 11.11.2018. Morabanc Andorra crushed Baskonia at home 93 - 73. Andrew Albicy posts 16 points and 6 assists for Andorra in Liga Endesa jornada 8. Real Madrid crushed Maccabi on the road 87-66, Gustavo Ayon posts double-double 12 points, 12 rebounds, 3 assists and 1 block. Ante Tomic scored 16 points, 3 assists and 3 rebounds in the Barcelona win over BC Khimki. Luigi Datome posts 16 points, 5 rebounds and 1 assist in the Fenerbahce win over Bskonia 74-72. Fenerbahce defeated Baskonia on the road 74-72, Joffrey Lauvergne helped to beat Spanish team with 15 points, 2 assists and 1 block. Fenerbahce beat Baskonia in Euroleague round 6. Tornike Shengelia scpred 15 points, 5 rebounds and 1 assist on 09.11.2018. Panathinaikos Athens 93 - 80 Olympiacos Piraeus, Euroleague rs6. Calathes scored 14 points, 7 assists and added 7 rebounds against Olympiacos. Printezis scored 26 points, 3 assists and 4 rebounds against Panathinaikos, but it wasn't enough for Olympiacos. Panathinaikos 93-80 Olympiacos, euroleague round 6. Olympiacos was defeated by Panathinaikos on the road 93-80. Janis Timma scored 17 points and added 3 assists in the Greek derby. Lukas Lekavicius led Panathinaikos to the win over Olympiacos with 17 points, Euroleague round 6. Panathinaikos beat Olympiacos at home 93 - 80. Thanasis Antetokounmpo scored 12 points, 1 block and 2 rebounds. Alexey Shved Highlights 27 Pts, 6 Ast vs Barcelona 09.11.2018 Euroleague RS6. Khimki Moscow was defeated by Barcelona at home 80-87. Khimki Moscow Region 80 - 87 FC Barcelona Lassa 09.11.2018 Euroleague RS Round 6. Chris Singleton scored 16 points and 1 block in a win against Khimki Moscow. FC Barcelona beat Khimki Moscow on the road 87-80, Thomas Heurtel scored 18 points, 8 assists and 2 rebounds. Jaycee Carroll helped Madrid take a win from Tel Aviv on the road 87-66 Euroleague round 6. Johnny O'Bryant Highlights 17 Pts vs Real Madrid Euroleague. Johnny O'Bryant scored 17 points, 3 assists and 7 rebounds for Maccabi Tel Aviv 66-87 Real Madrid 08.11.2018. Real Madrid defeated Maccabi Tel Aviv on the road 87-66 Euroleague round 6. Sergio Llull scored 17 points and 2 assist for Madrid. Euroleague round 6, Olimpia Milan lose at home to CSKA 85-90. Gudaitis scored 16 points, 7 rebounds and 2 blocks.